Like one of Giacometti’s elongated statues, a jaywalker surveys the gridlocked traffic as the camera observes the shallow focus scene through a foreground field of condensation. 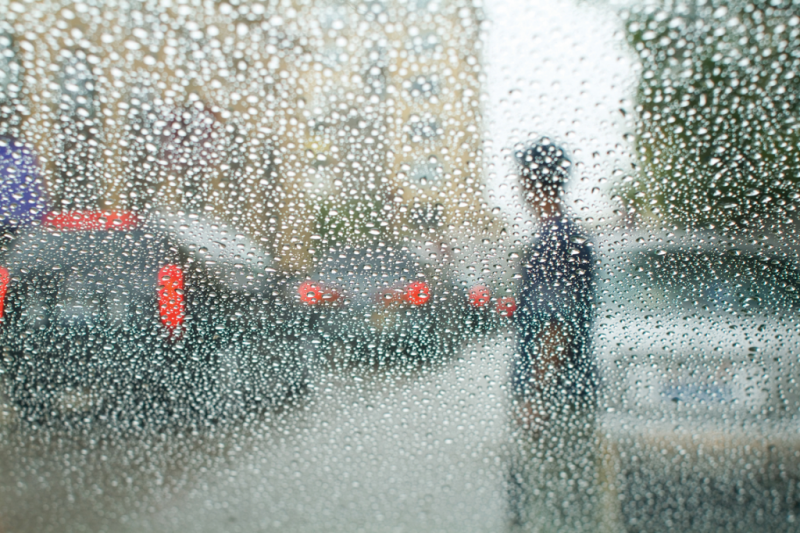 This image is part of an extended series entitled “City Rain”, scenes of Chicago photographed through my car windshield. Neon fluorescence and radiant red light from car brake lights are common themes, but more abstract and suggestive patterns are created by silhouetted pedestrians hastening along with pendulous umbrellas; vehicles such as towtrucks or sixteen wheelers, made more ominous in the dreamscape of their out of focus state; or lonely objects in storefront windows, rendered redundant by the inclement weather. I search for different colorations, shooting at various times of day when the hue of the sky can contribute to the tableau. It is a voyeuristic, random pursuit as I travel around, like a benign Travis Bickle, looking for something. Photography is my first passion, it led me into related endeavors including graphic design, book publishing and photographic quality printing. Selected by Tim Wride, Curator of Photography at the Norton Museum of Art.